Other photos: Main Salon, Main Salon, Main Salon, Salon / Galley / Dinette, Galley, Galley, Galley Dinette, Pilothouse, Pilothouse, Pilothouse Settee, Stairwell to lower deck, Master Stateroom, Master Stateroom, Master Stateroom, His & Her Master Bath, VIP Stateroom, Forward, VIP Stateroom, Forward, VIP Guest Head, Queen Guest Stateroom, Queen Guest Head, Upper/lower Guest Stateroom, Flybridge, Flybridge, Flybridge Helm Station, Flybridge Helm Station, Flybridge, Photo 27, Flybridge, Aft, Flybridge Aft, Waverunners, Hardtop w/opening, Forward Deck, Aft Deck, Aft Deck, Cockpit / Swim Platform, Engine Room, Engine Room, Exterior. 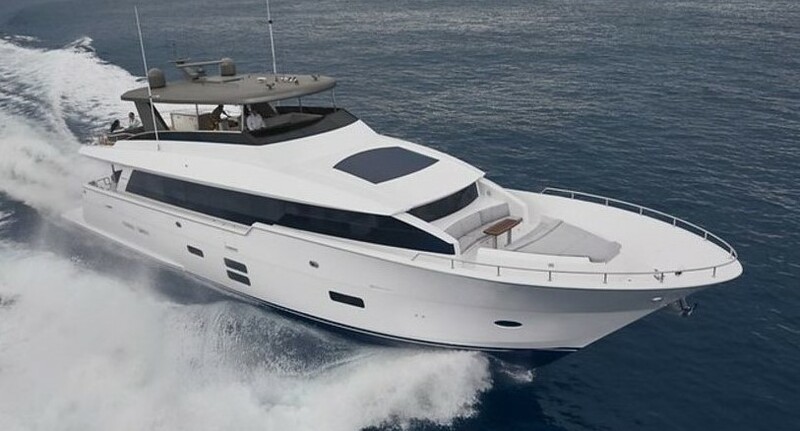 FREEDOM represents a totally customized example of the popular 75' Hatteras Cockpit Motoryacht which had an interior refit and updated electronics in 2014. Her pilothouse bulkhead was moved aft creating an oversized pilothouse featuring an L-shaped settee and table. Her four stateroom layout features a desirable cherry wood interior, custom wallcoverings and window treatments, custom Onyx in all baths along with custom hardware & fixtures. Powered by Caterpillar 3412s and equipped with Datum digital Naiad stabilizers, twin 27.5 KW generators, bow thruster, watermaker, stainless steel & glass salon sliding door and tender.